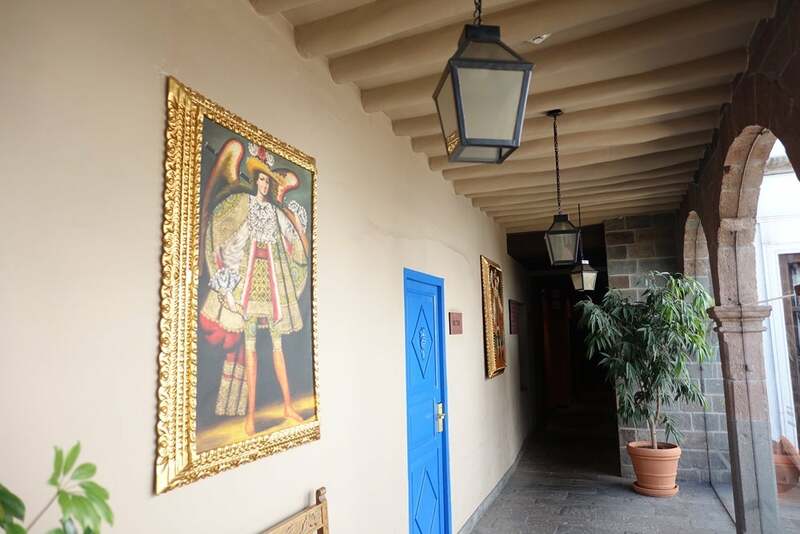 The Palacio del Inka is a palace-turned-museum-turned-hotel that embodies the spirit of Peru and displays a mix of Inca and Spanish cultures. 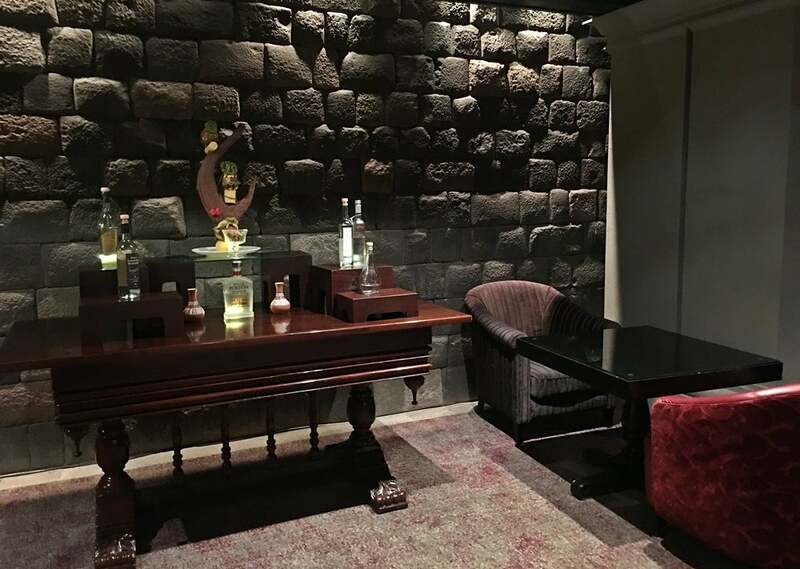 The Pros: a beautiful, historic property with free tours, pisco tastings and a great spa. The Cons: small, dark rooms that were far from the lobby. During a recent three-week backpacking adventure in Peru, I decided to treat myself to few nights of luxury between treks through Colca Canyon, the Sacred Valley and Machu Picchu. 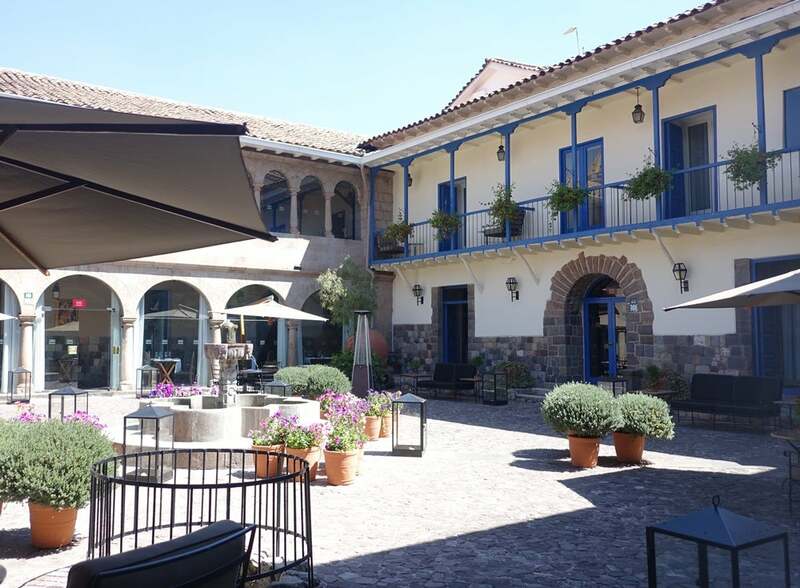 Palacio del Inka, a Starwood Luxury Collection property, was an ideal spot to relax and spend some time adjusting to the altitude. 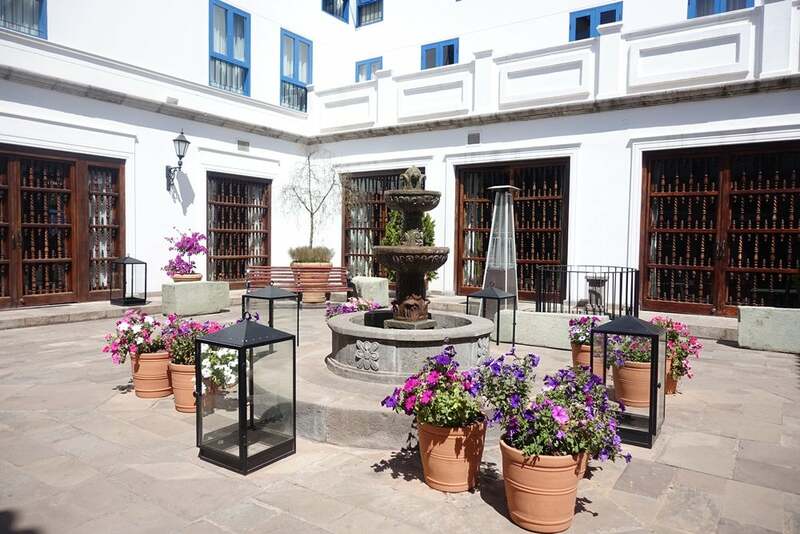 Recently renovated, the property’s mix of Spanish Colonial style and Inca charm perfectly emulated Cusco, the city in which the hotel stands. Here’s what it was like to stay there. I booked my stay directly through the Starwood website. 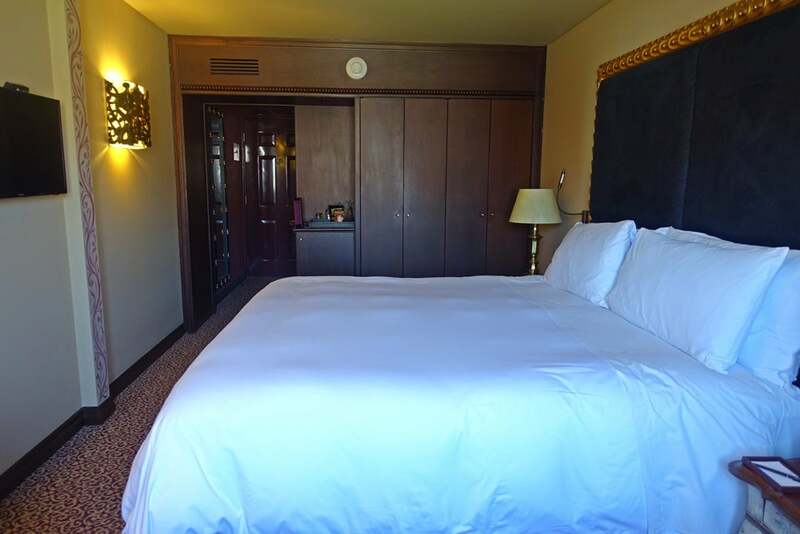 Rates started at about $208 (pre-tax) or 10,000 Starpoints per night for the lowest option, the premium room. I paid for my three-night stay with my Starwood Preferred Guest® Credit Card from American Express, which lets you earn 2x points when you use the card to book a stay at a participating Starwood property and gives you a $100 statement credit after you spend $1,000 in purchases in the first three months. Plus, an additional $100 statement credit after your first purchase at participating SPG or Marriott Rewards hotels in the first six months. Had I been staying there more than three nights, I would have used my Citi Prestige Card so I could take advantage of its nifty 4th Night Free perk. Alternatively, you could pay for your stay with a travel card like the Chase Sapphire Reserve or the Chase Sapphire Preferred, which lets you earn 3x or 2x points on travel purchases, respectively. 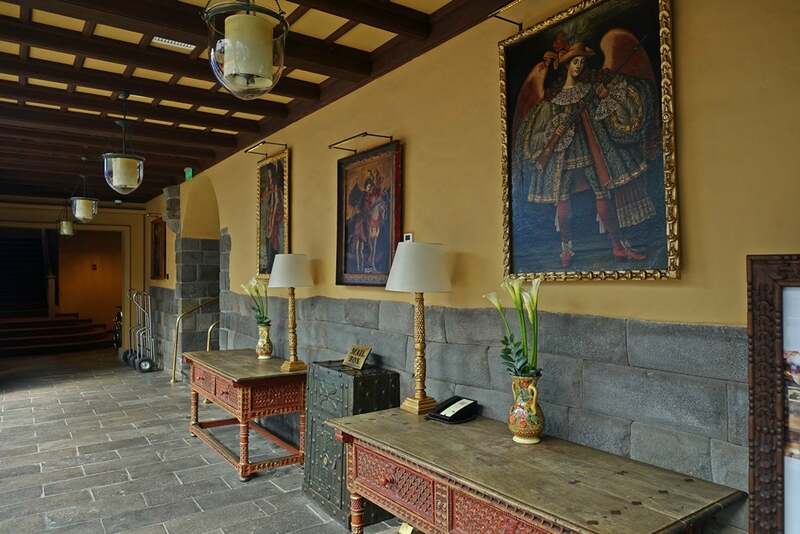 As the name suggests, the stunning Palacio del Inka hotel was once a palace, an extension of the Inca Templo del Sol. When the Spaniards arrived in the 1530s, it became a home where several Spanish families lived — Templo del Sol was later turned into St. Dominic’s Church. 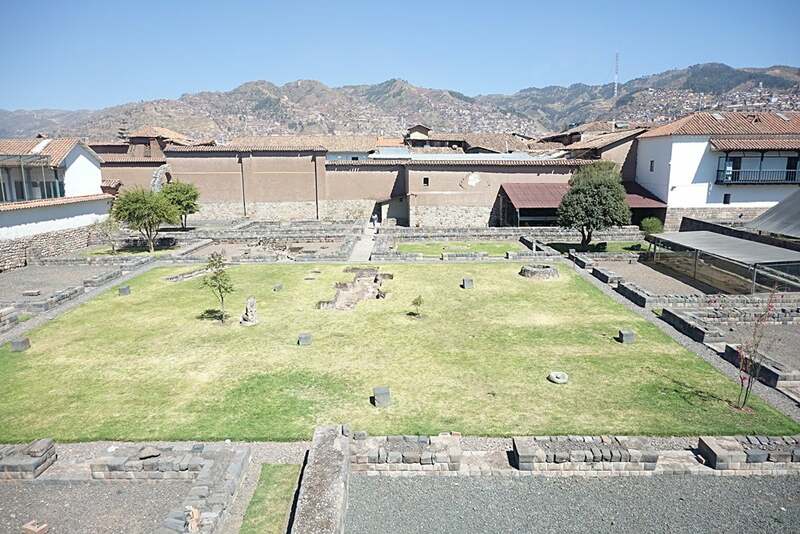 In the 20th century, the palace became a museum, housing many of Cusco’s important Inca and Spanish artifacts. The property was sold to Peruvian and Spanish owners in the 1970s for $11,000 and turned into a hotel, which changed hands several times and eventually ended up as a Starwood Luxury Collection property. 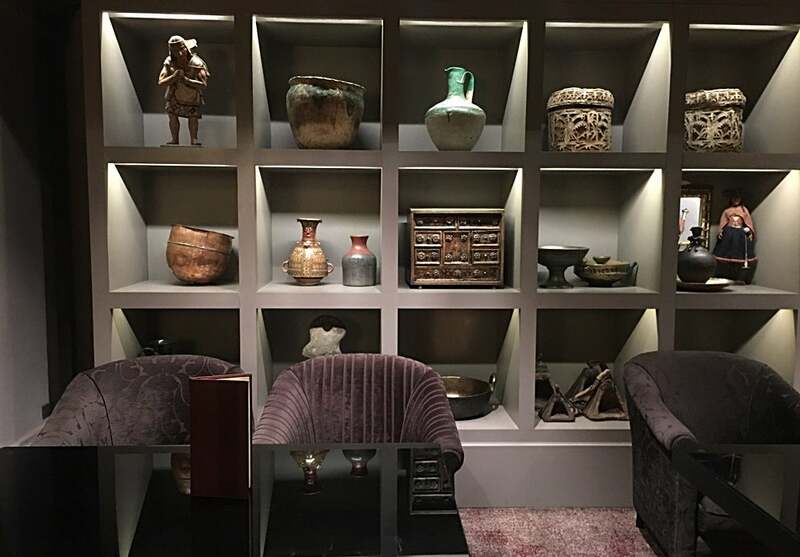 Although the hotel was was renovated about five years ago, during my visit, I noticed it still housed many of the artifacts that were once kept in the museum — this was not just a place to spend the night, but a real historical and cultural experience. 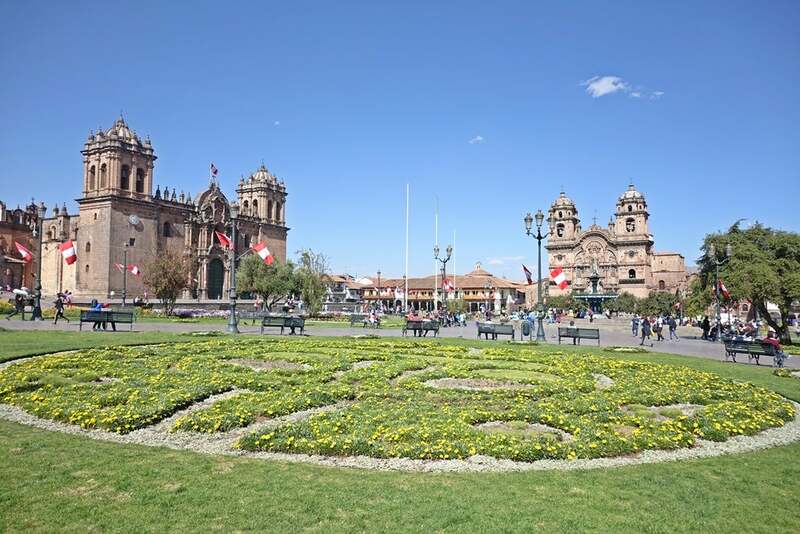 The hotel is about a 10-minute walk from Plaza de Armas, Cusco’s beautiful main square. It was easy to get in and out of the city from the hotel when I needed to, since it’s just a 10-minute taxi ride from the bus station and a 20-minute taxi from the airport — don’t be afraid to bargain with the taxi drivers to get good rates, like I did. The hotel was also within walking distance of many shops, restaurants, bars and tourist attractions. 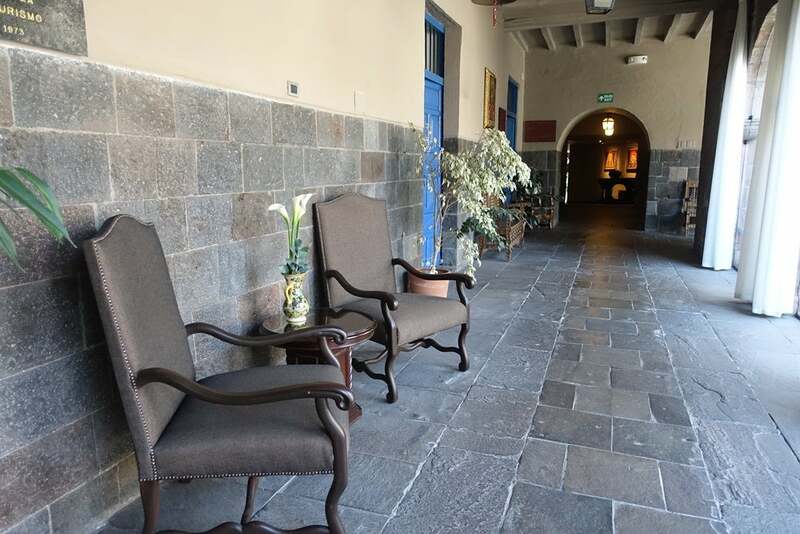 The luxury started as soon as I was welcomed through the large doors to the lobby of Palacio del Inka. 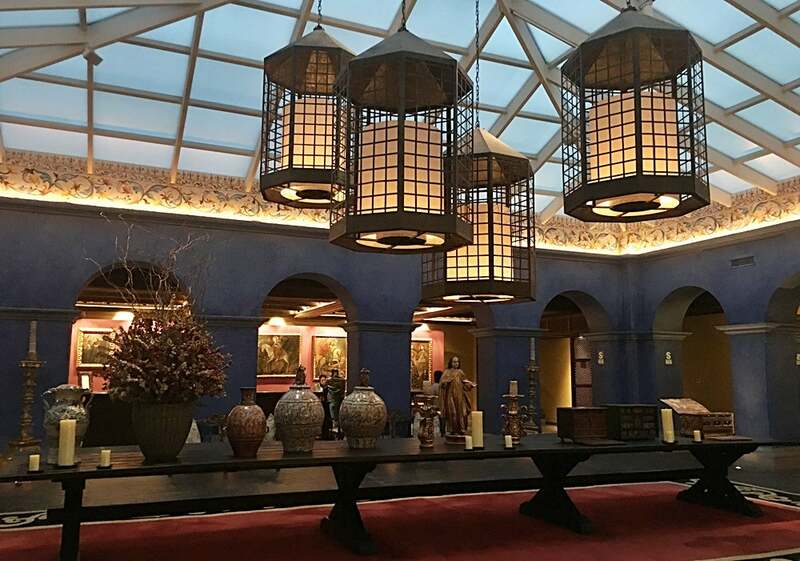 Its high ceilings and beautiful artifacts made me wonder if I’d mistakenly entered a museum instead of a hotel — at the time, I didn’t realize the hotel had actually been a museum. Once I spotted the check-in desks, I realized I was in the right spot. 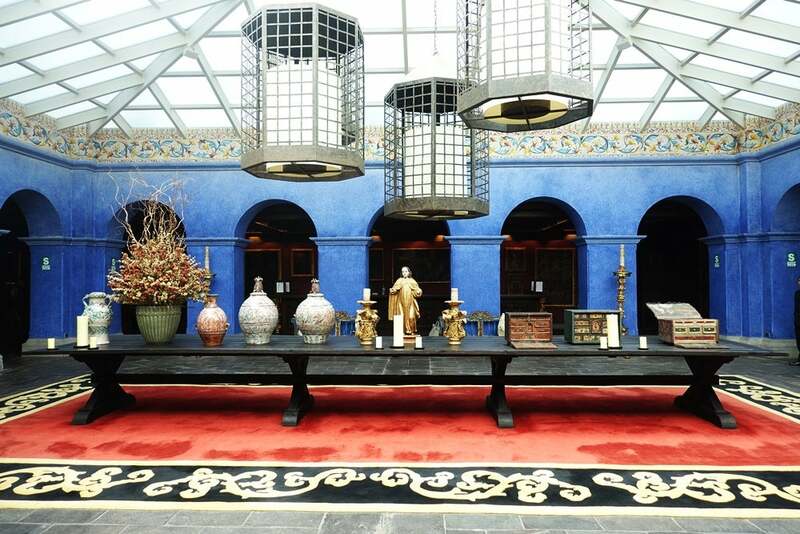 I took my time wandering through the foyer and lobby before checking in, admiring the paintings and pottery around me. 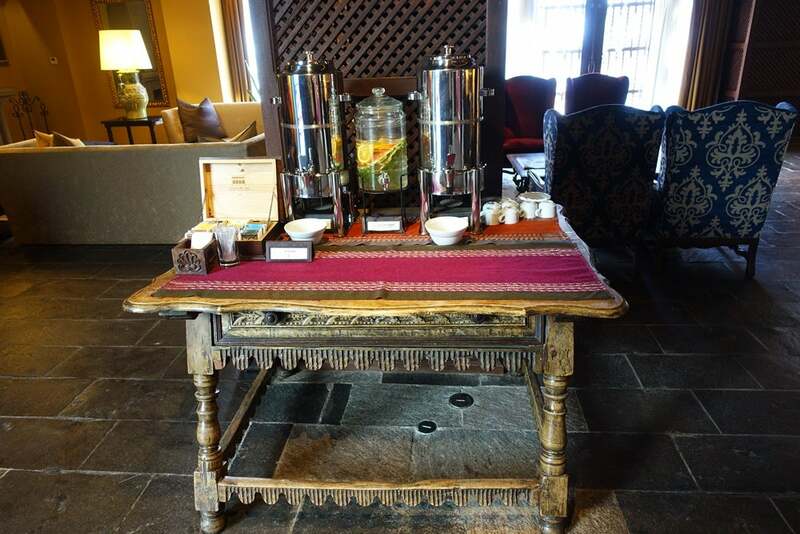 There was also a small stand with coca tea (great for adjusting to the high altitude), coffee and water for guests. 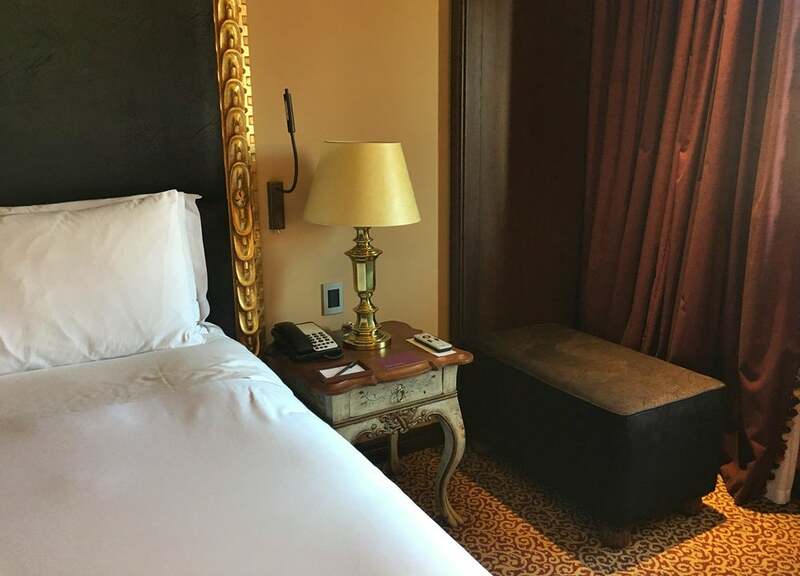 I had requested an early check-in of 10:00am and was delighted to hear that my room was ready and that I’d also been upgraded from a regular premium room to a premium room with a view of the temple ruins. I later found out that while these rooms had interesting views, they were actually smaller than the regular premium rooms, which was kind of a bummer. The premium rooms with a view run about $12 more than the regular premium rooms. Since I never got to see the room without the view, I can’t comment on whether or not it was worth it, but I did notice the small size of the room with a view. At check in, I was told breakfast would be $23 more if I added it on then, but if I waited until the next day, I would be charged $29 for breakfast. I decided to tack on breakfast for one day even though I knew I’d be able to go into any nearby café and have something for a third of that price, which I did the other two mornings. 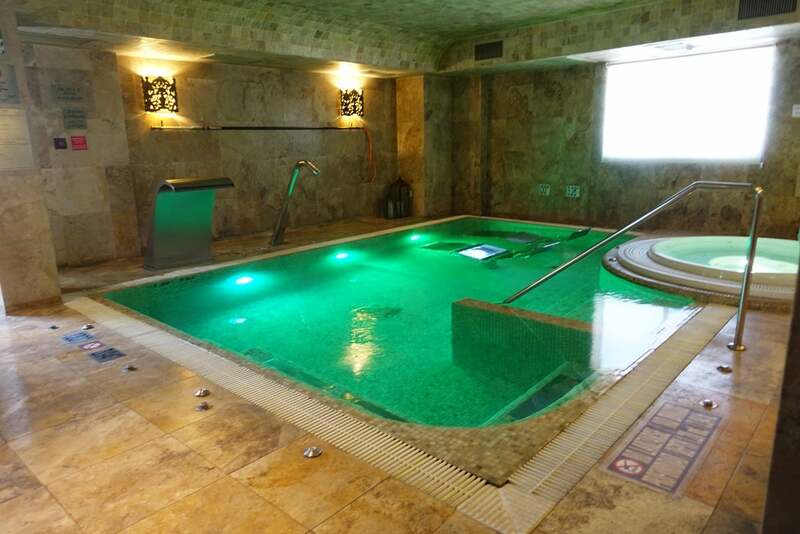 There was a special deal for two people to do the spa circuit for 150 Peruvian Sol (~$46), which I did sign us up for. 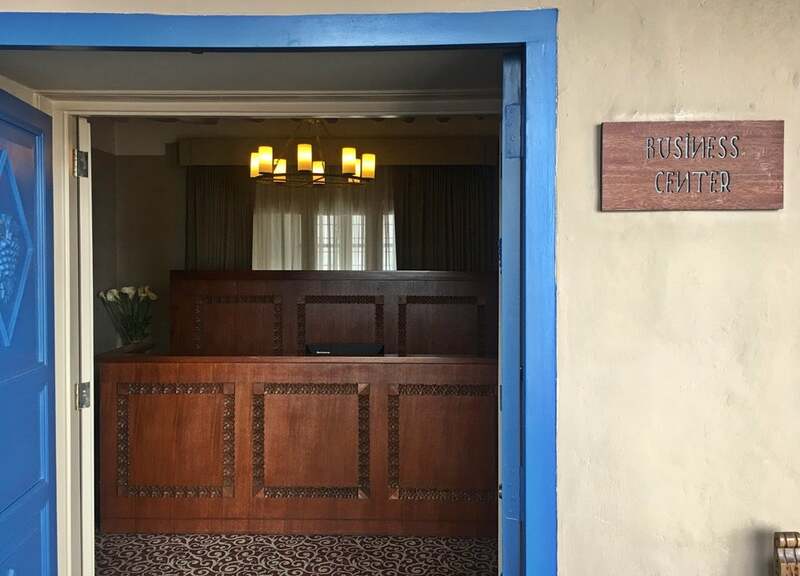 Unfortunately, the front desk staff never mentioned the free tour of the property that occurred daily at 5:00pm, nor were we told about the complimentary pisco tasting that happened each night at 6:00pm. Luckily, I stumbled upon both of those later. One thing I made sure to confirm was that I was able to store my large backpack at the hotel for two nights while I went to Machu Picchu. I had planned to stay one night at this hotel, head out for two nights and then return for two more nights, so was pleased to hear my large backpack would be held safely until my return. I was finally led to my room, which was a long trek from reception. Since the hotel was so beautiful, I didn’t really mind. We headed through the lobby’s seating area, bar and restaurant, past a courtyard and down several hallways. We eventually came upon a hidden bank of elevators and headed up to the third floor to my room, 327. 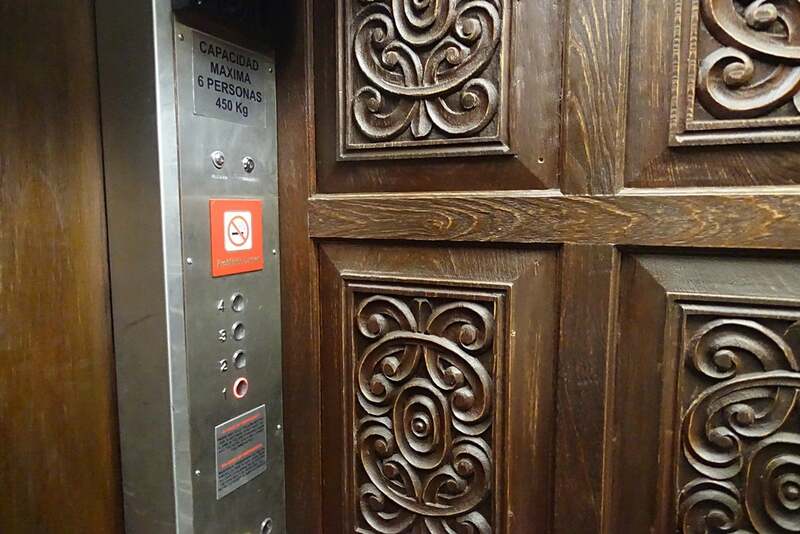 Even the elevators here had intricate woodwork next to the modern metal buttons. My first impression of the premium room with a view was that it was a little small and dark, but well-decorated and comfortable. 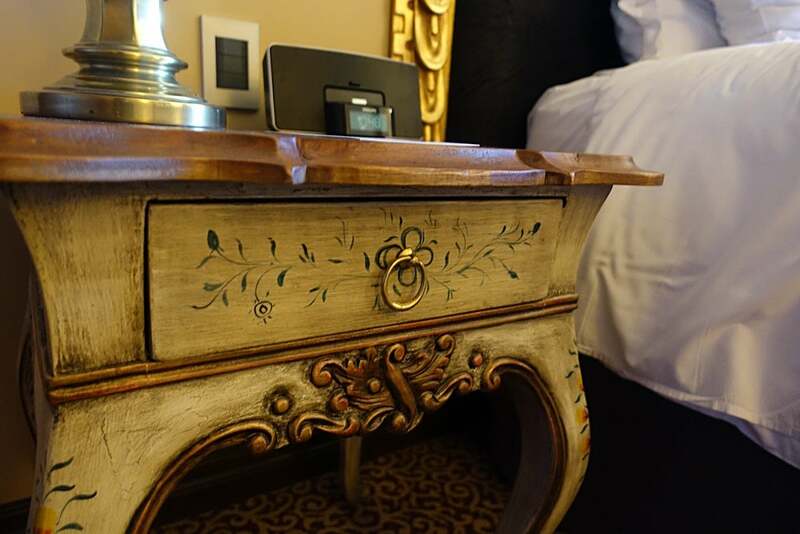 It came with a king-size bed, mini-bar and a desk with an armchair — not a proper desk chair. Two nightstands were on either side of the bed. Next to that was a large ottoman, which I set my backpack on. There was a large window with a view of the Inca ruins and part of the old temple. It wasn’t the most beautiful, but still one of the most unique room views I’ve ever had at a hotel. 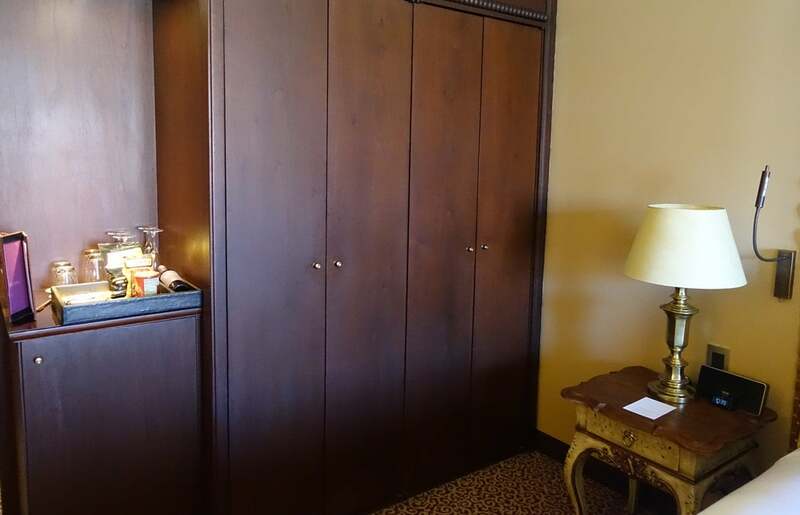 The closet was large and offered plenty of storage space. It held a safe, robes and slippers. 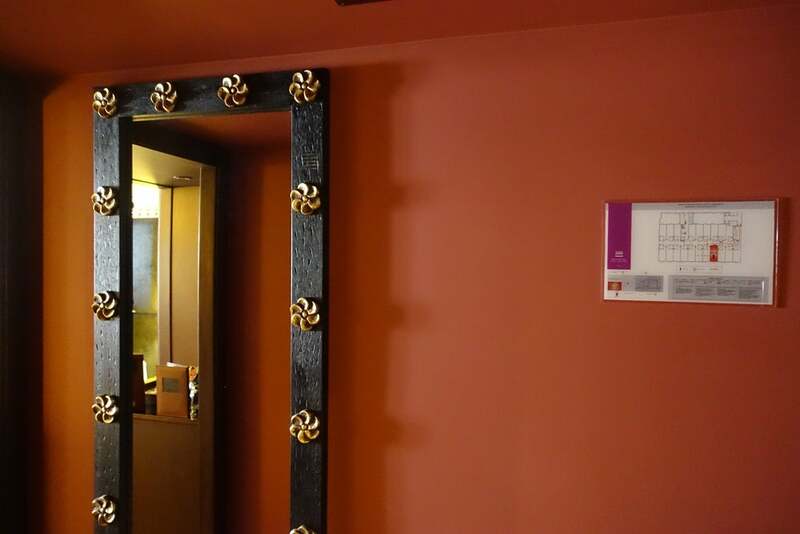 Small details like wooden lamp covers and intricately carved decorations along the full-length mirror gave the room character. 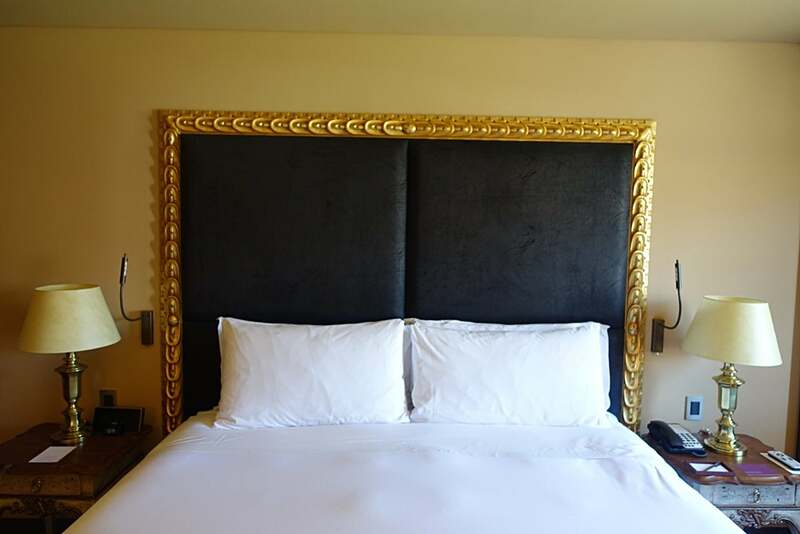 The headboard was beautiful and the bed was comfortable. I slept well there, though perhaps it was because the altitude had worn me out. 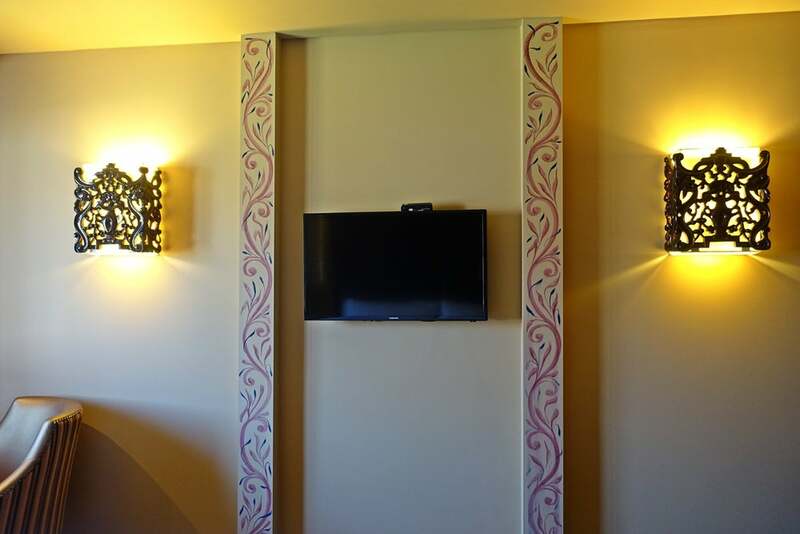 Colorful walls gave the room a unique touch as well. 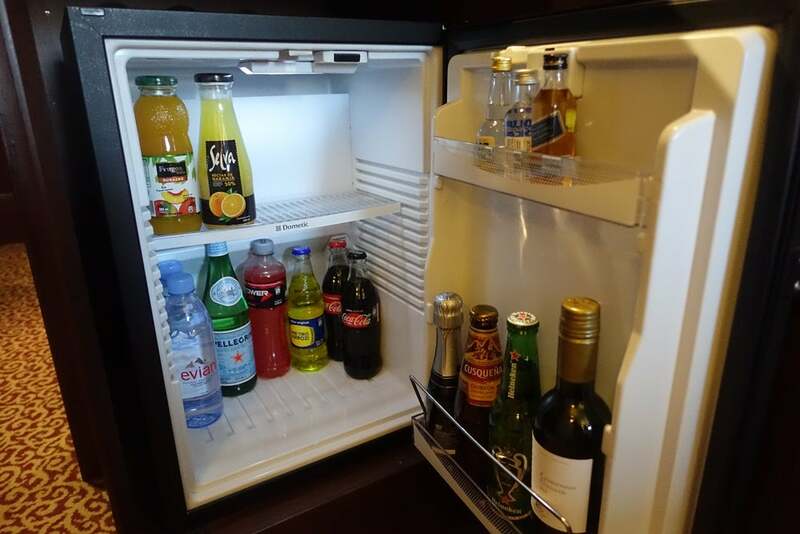 The mini-bar was stocked with alcoholic and non-alcoholic drinks. 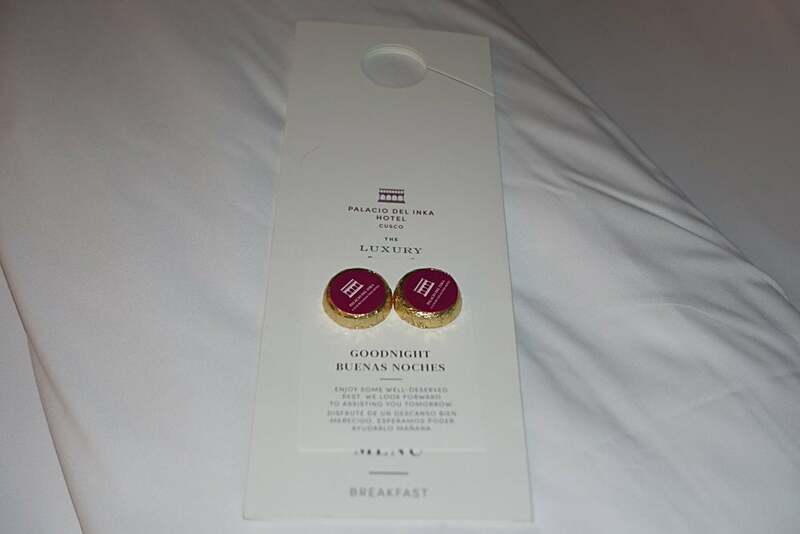 I loved that the hotel offered evening turndown service — robes and slippers were set out and the bed prepared, while a card with the following day’s weather and two dark chocolates were left on the bed. Using the room as a workspace wasn’t ideal as it was a little dark in the evening even despite the many lamps. Having an armchair in lieu of a desk chair seemed like a good idea in theory, but when you actually needed to do work at the desk, it wasn’t comfortable. There were enough electrical outlets in the room for all my electronics, which was convenient. In-room Wi-Fi was complimentary, and the speed was excellent. 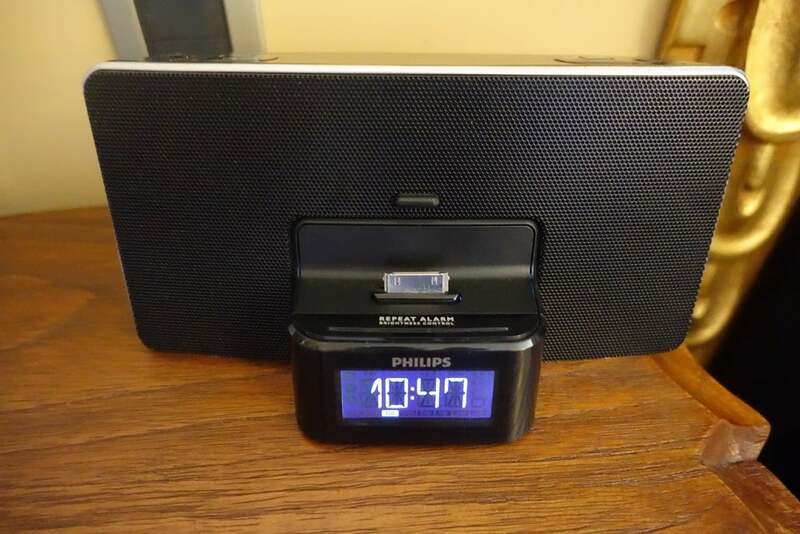 I noticed there was an alarm clock with an iPhone 4 hookup, so it’s time for an update on that. There was a flat screen TV hanging on the wall, but I never used it on this trip. 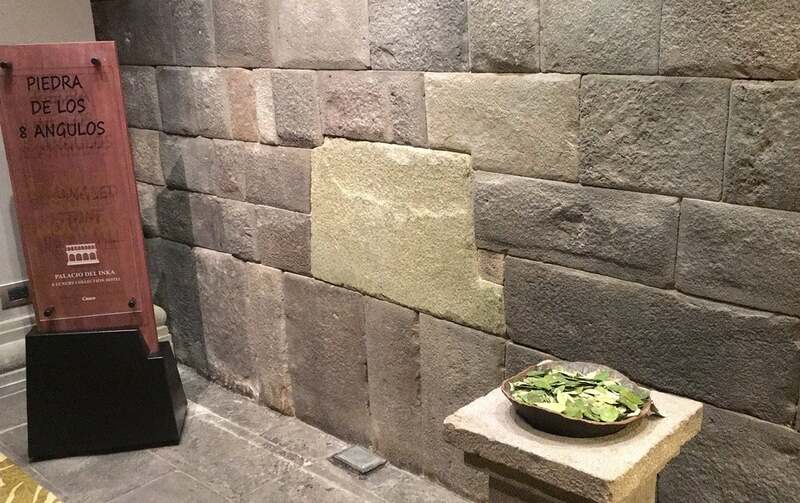 It’s important to note that the rooms at Palacio del Inka didn’t have air conditioning. The weather in Cusco was mild during my stay, with nights in the low-50s and highs during the day in the low-70s, so this wasn’t an issue for me, but it may be something to consider if you run hot. The windows did open slightly, which I appreciated whenever I needed some fresh air. 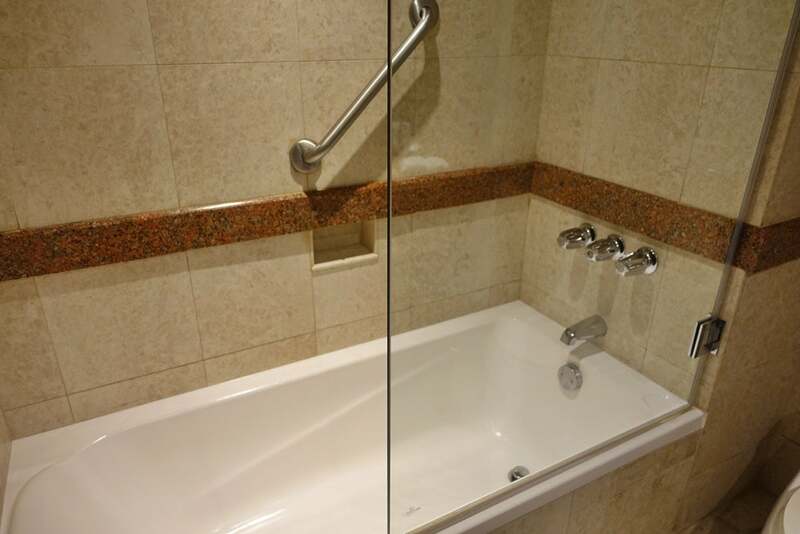 The bathroom had marble floors, a toilet, a bathtub/shower and a sink with storage space along either side. It was small but fine for my short stay. The Essential Elements bath amenities were pretty generic and nothing to write home about. 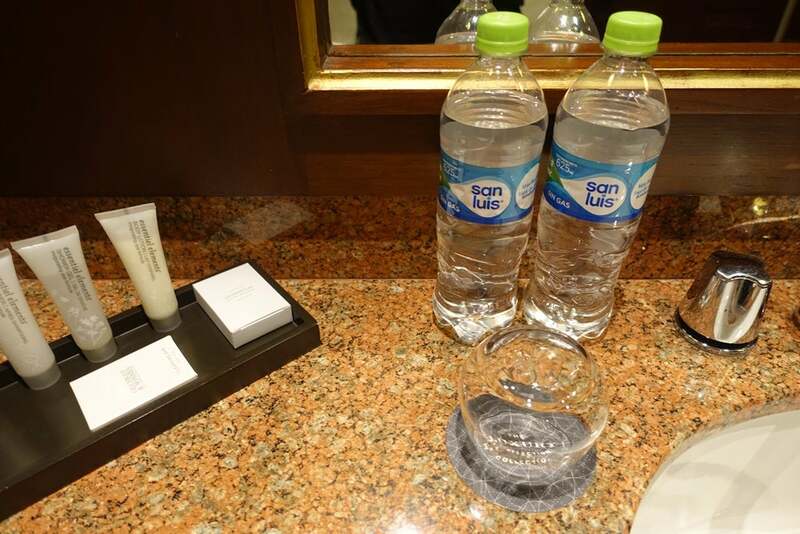 Two free bottles of water were replaced daily in the bathroom, as drinking tap water wasn’t recommended. The good thing about this property being so large was there was plenty to do and explore. I spotted a group of people walking around, and when I asked about it, the staff said there was a daily tour of the property at 5:00pm for hotel guests. It lasted about 20 to 30 minutes and made me realize how special and historic the hotel really was. One of the highlights was hearing about and seeing the eight-angle rock, an Inca symbol of spirit and energy. The stone was part of the original palace walls hundreds of years ago and, as you can likely tell from the name, it has eight different angles. 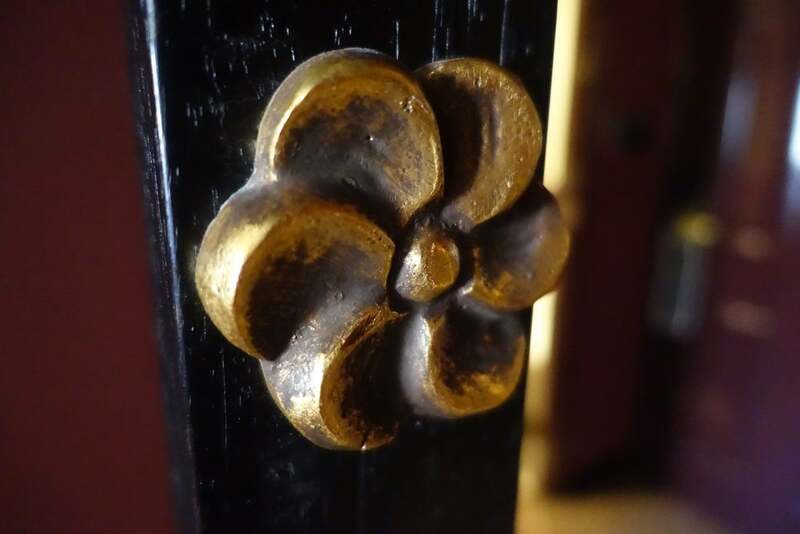 The tour also provided some background on the many pieces of art that could be found around the property. 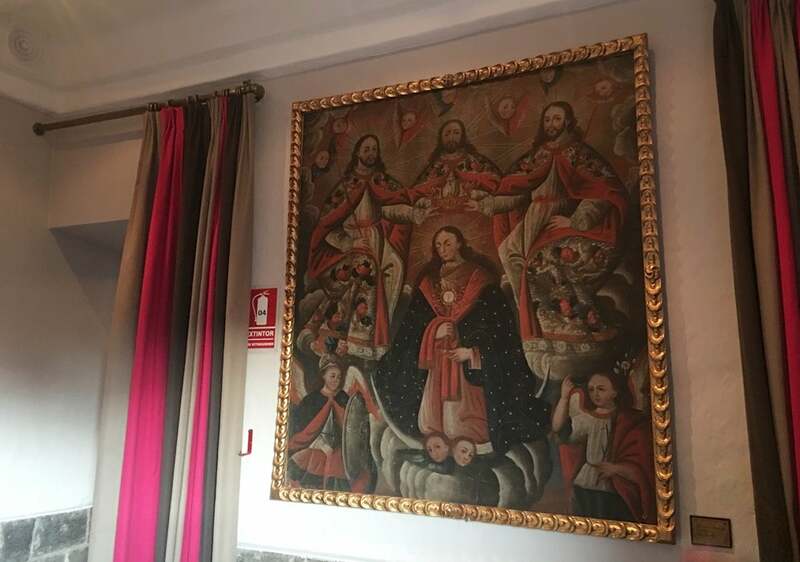 Our guide explained that some of the paintings were typical Cusqueñan art, meaning that the Inca artists hid traditional symbols within religious paintings that would please the Spaniards. One example showed the Virgin Mary looking like a mountain, a subtle and silent act of protest by the Inca, who were being forced to convert to Catholicism. 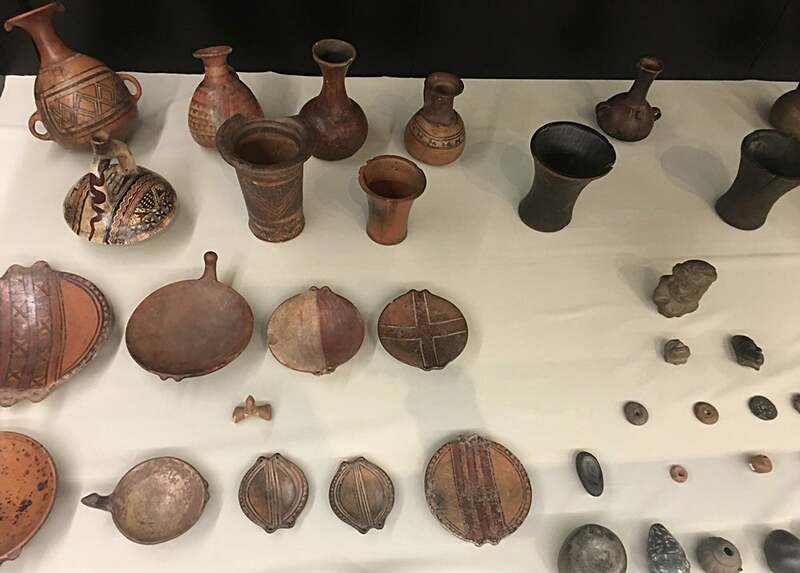 The artifacts and artwork were a mix of Inca treasures and Spanish colonial items. One of the courtyards featured a well that was used hundreds of years ago. During the tour, I found out about the nightly pisco tasting, which was the second thing I wish had been mentioned at check in. 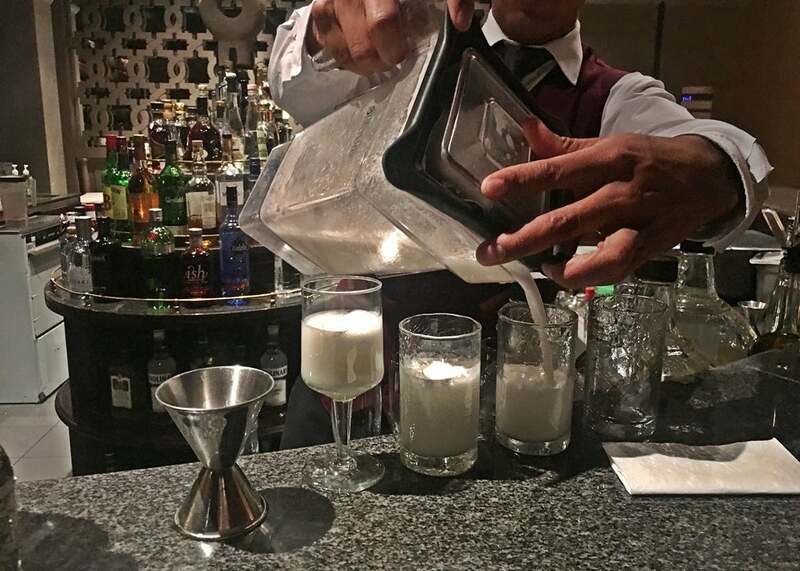 In the hotel’s Bar Rumi, I sampled three different types of pisco and learned how to make a pisco sour from Nahum, our knowledgeable bartender, alongside a few folks who were visiting from Argentina. 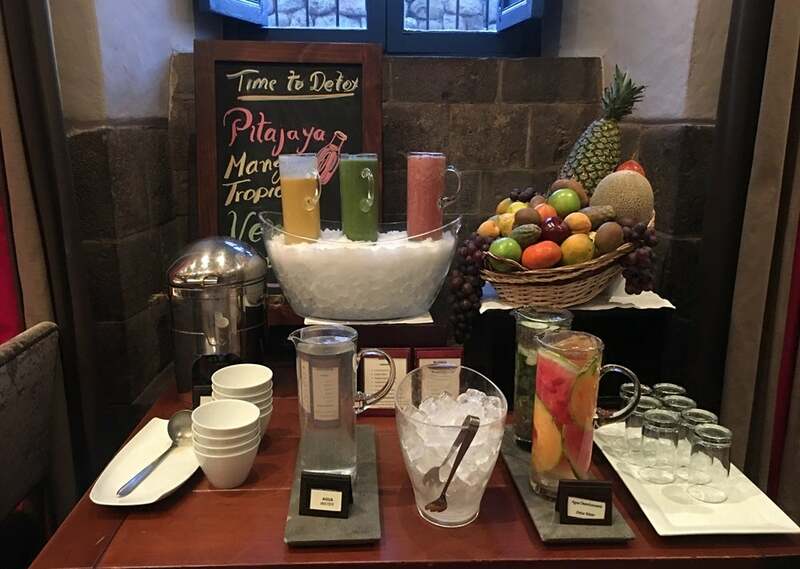 I loved that the hotel offered this, because pisco is such a huge part of Peruvian culture, though I did find out during the tasting that the Spanish were responsible for bringing the grapes over to Peru from Spain. The tasting was free, and I didn’t feel any pressure to purchase drinks afterward — I wanted to because the bar was stunning and filled with more artwork and artifacts to check out. I could have lounged late into the evening on the jewel-toned, comfortable armchairs, but instead I decided to take advantage of the spa. The spa circuit lasted one hour and was absolutely fantastic. My partner and I were the only two people there so it was a private and relaxing experience. We started off in a small pool with all sorts of jets and waterfalls — there were even two special chairs inside the pool that had jets — followed by the hot tub, a hydromassage shower, a steam room and sauna. We finished by sipping tea in our robes on heated lounge chairs. I was really pleased with the spa experience, which was the perfect cure for my aching muscles after many long days of hiking. I also got a facial, which was great and affordable at 190 soles (~$58). 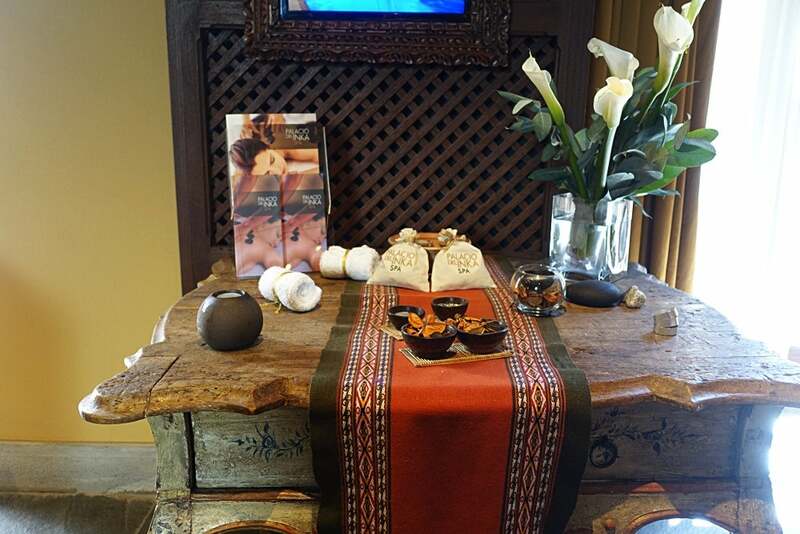 The spa used Germaine de Capuccini products, which are very high-end. 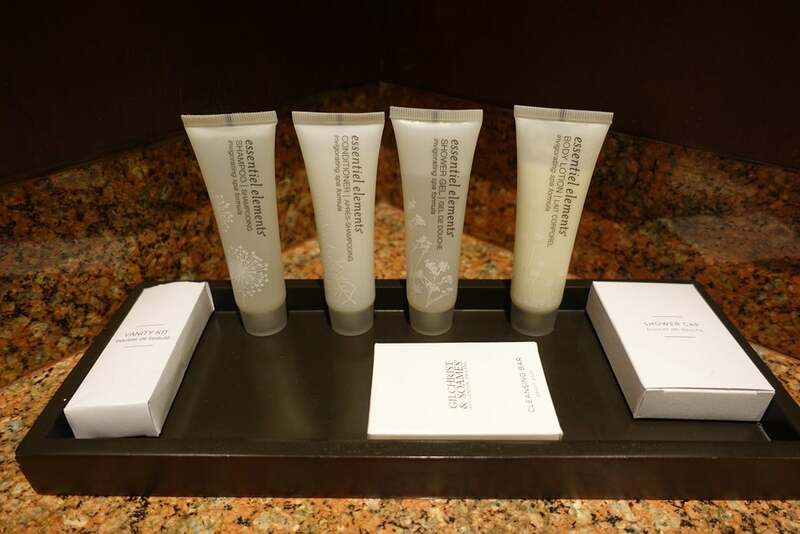 I wished the rooms had used this brand for the bath amenities. The spa was open until 10:00pm too, which was convenient as my days were full of sightseeing and I wasn’t back at the hotel until later in the evening. 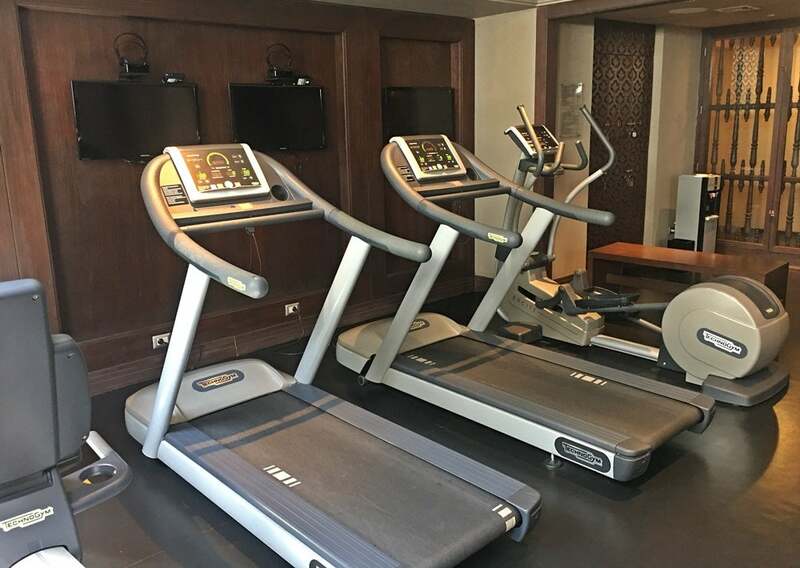 The fitness center was on the small side and equipped with various cardio and weight equipment. It was decked out in wooden Inca-themed decor like the rest of the hotel and I thought it was an interesting juxtaposition being next to the modern gym equipment. For those struggling with altitude sickness — a very real thing in this part of Peru — in-room oxygen tanks were available upon request and coca tea could be found in the lobby. 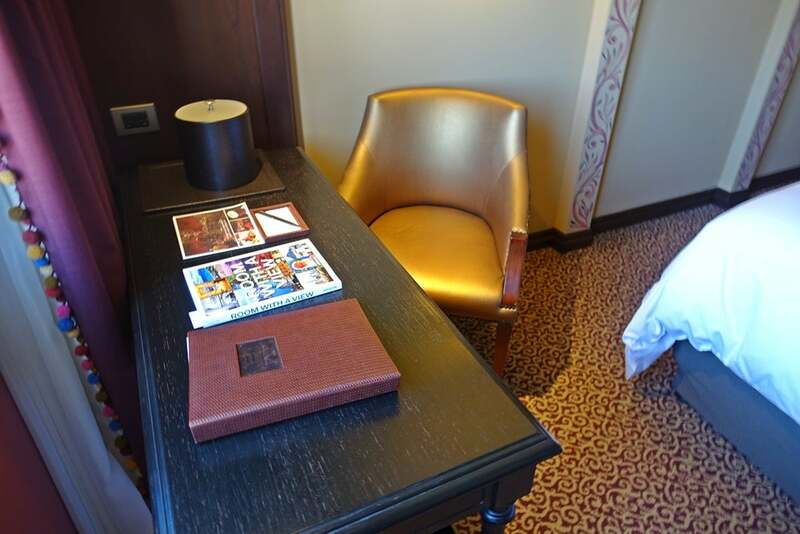 There was also a business center, which I considered visiting when the in-room armchair became too uncomfortable for working at the desk. 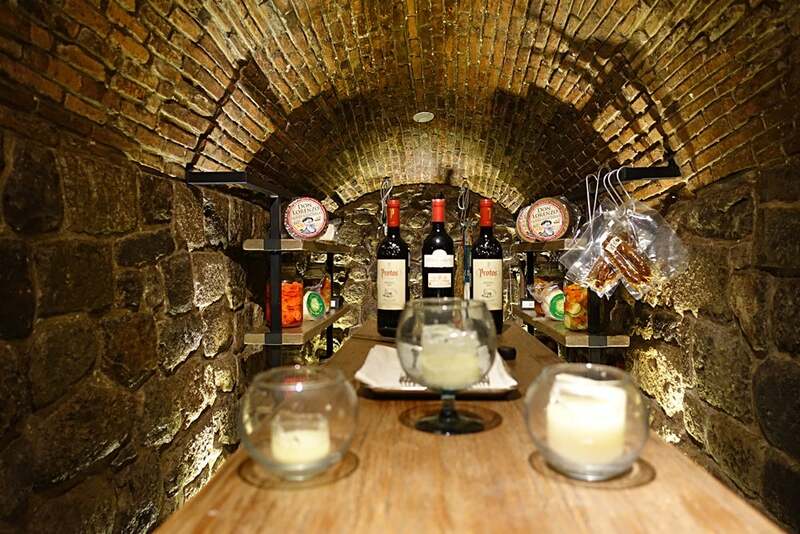 You could also have special wine and cheese tastings in the wine cellar for an additional cost, but I just didn’t have time to try this out. I did notice that many of the wine and cheeses were from Spain, though, and since I live in Madrid, I figured I could sample these items there. 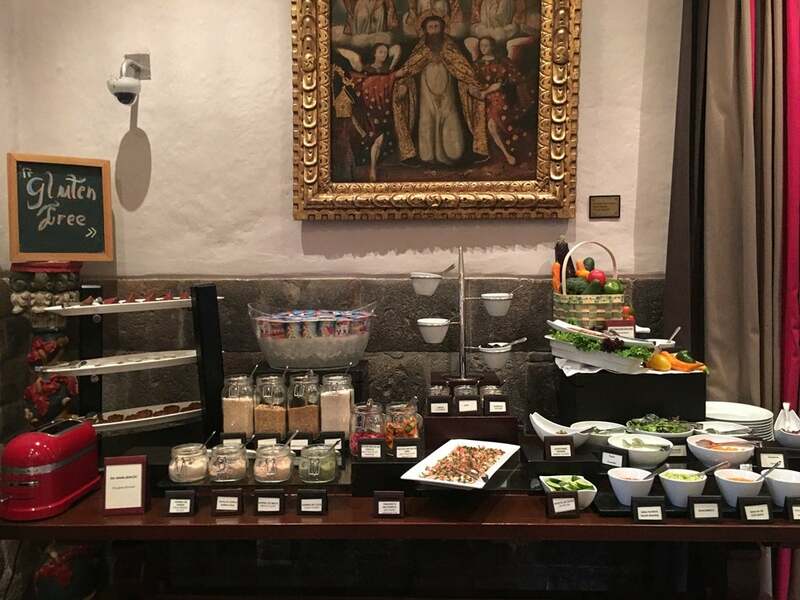 The breakfast buffet was well-stocked, with a large selection of breads and pastries as well as hot food items like eggs and potatoes. There was even a special detox section with juices and a variety of tropical fruit. 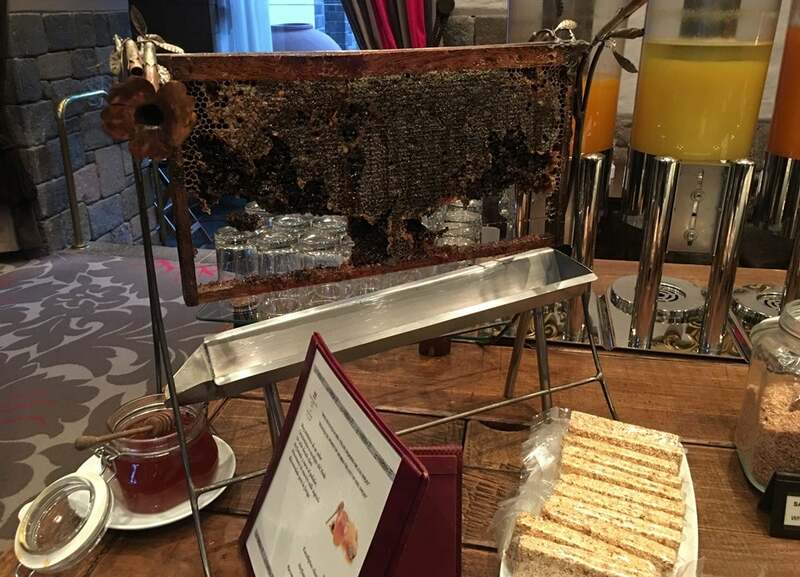 A selection of honey and fresh honeycomb were also set out. 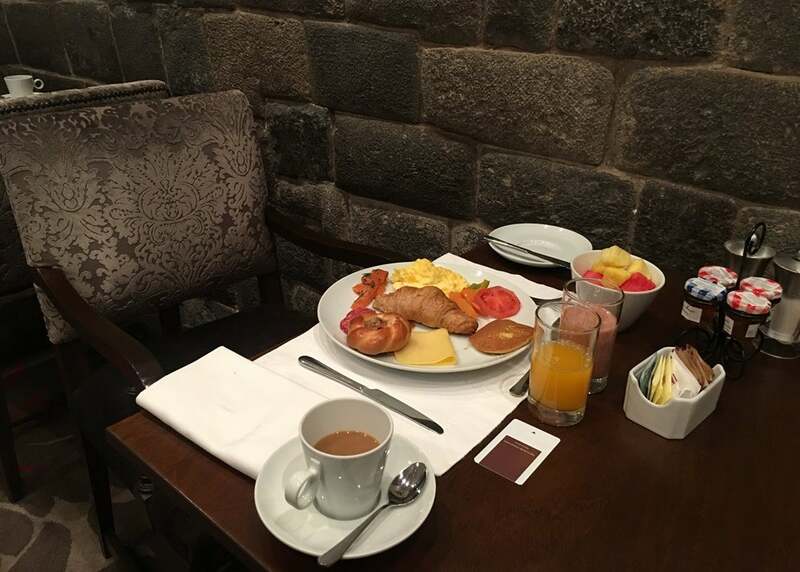 Breakfast started daily at 4:30am, which was convenient since many tours start extremely early in the morning. 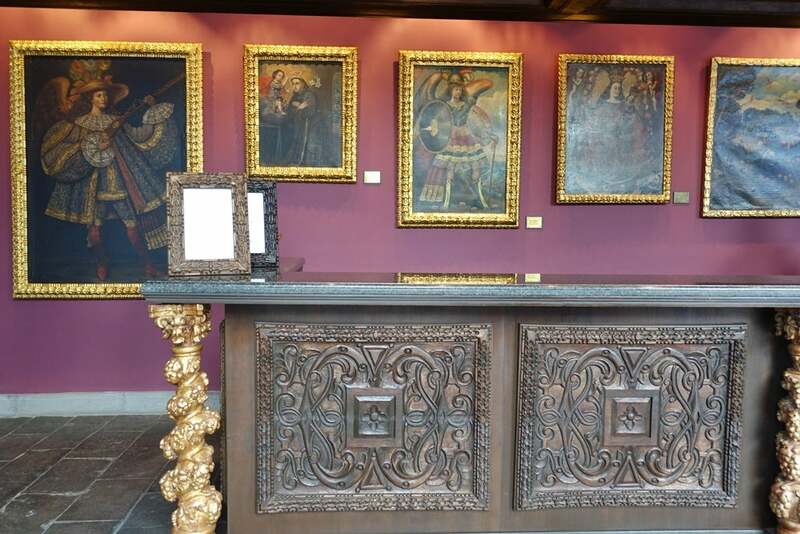 The restaurant had a dark, medieval feel and was decorated in a Spanish Colonial style with large paintings hanging on the walls and imposing, wooden tables and stiff chairs throughout the space. 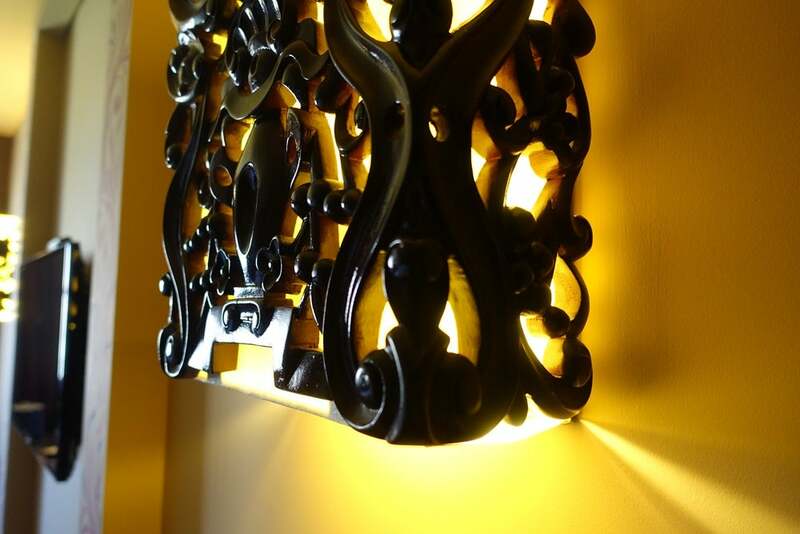 I wasn’t crazy about the design, but it worked with theme of the hotel. The Palacio del Inka was a beautiful property with comfortable and quiet guest rooms, though they were a little on the small side. 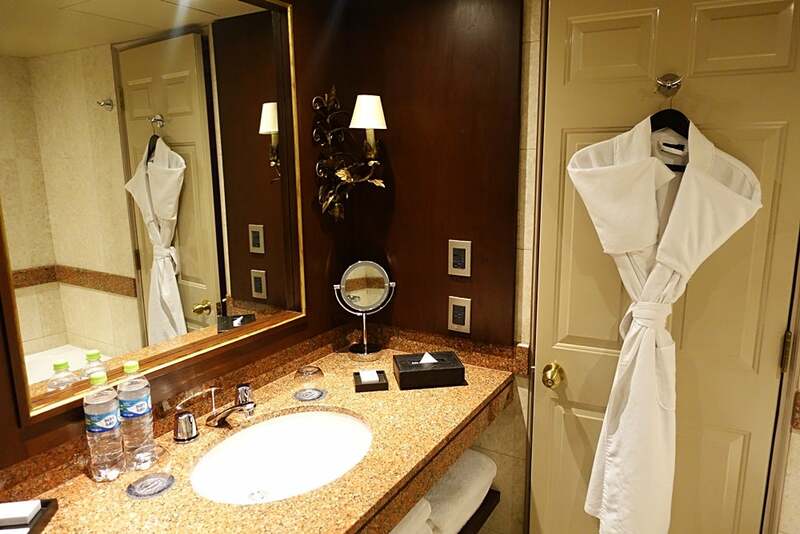 The spa was an added bonus, and those interested in culture will love the history and flair of this hotel. Note that if you plan to spend most of the day touring Cusco or the Sacred Valley, this option could be slightly pricier than many of the other smaller, boutique properties nearby. 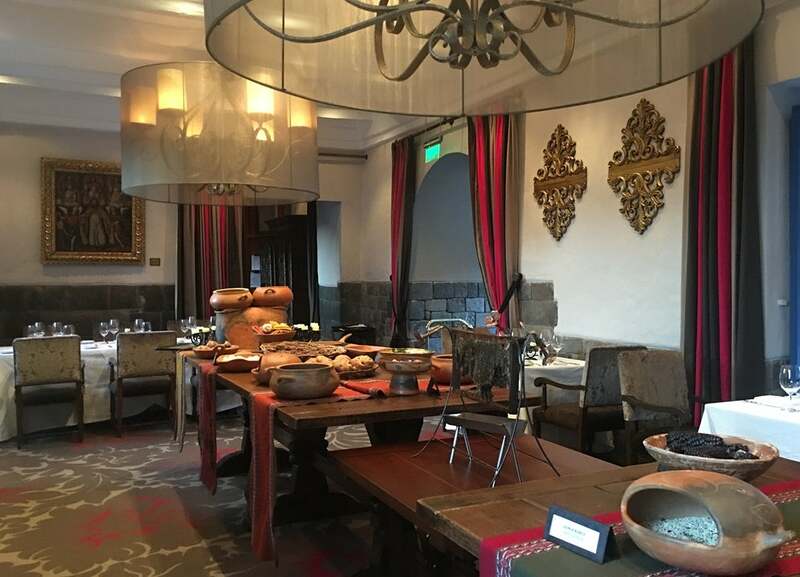 In any case, I would recommend the Palacio del Inka for a memorable stay in this charming part of Peru. 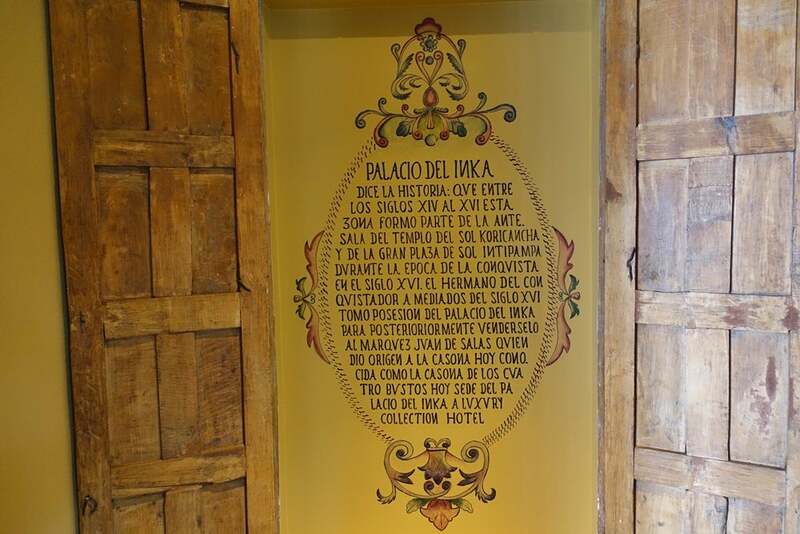 Have you ever stayed at the Palacio del Inka? Tell us about your experience, below.